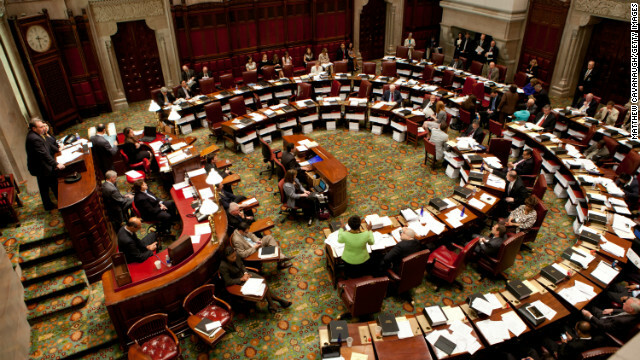 The New York state Senate as photographed in June 2011. (CNN) - Democratic Gov. Andrew Cuomo signed into a law Tuesday a new package of gun regulations to fortify the New York's existing assault weapons ban, limit the number of bullets in magazines and strengthen rules that keep the mentally ill from owning firearms. The state measure is the nation's first gun-control bill since the December 14 massacre in Newtown, Connecticut that left 20 elementary school students among the 27 killed by a gunman who then committed suicide. The measure was approved by the GOP-controlled Senate on Monday and the Democratic-led Assembly on Tuesday and was quickly signed by Cuomo. President Barack Obama will unveil national proposals which the White House described as "concrete" on Wednesday. Aand it passed with GOP support in the State Senate. Miracles do happen. Why not report what the new regulations say? Are they meanigful or just a political granstanding move? Why can't the U.S. Congress follow suit? God bless you, cuomo!!! Great. NY is not sold out to NRA idiots. Obama, do the same, ignore these pro-gun idiots. 26 children died invain. "Why not report what the new regulations say?" Because they're probably not all that harsh or controversial, partcularly in light of several GOPers in the state legislature voting for them. Therefore, it would only destroy the controversy-value of the story...and dampen the gun-fetishists' justifcations for a hissy fit...if CNN was to reveal what the legislation actually says. This way, the gun nuts can come to the comment section and continue throwing a massive, inconsolable hissy fit and not have to worry about being corrected or criticized for their tantrum having nothing to do with reality. It bans weapons that didn't have anything to do with Newtown. Better get a Christie story up post-haste, CNN. The NRA has no one but itself to blame. Abscent reponsible action on their part they had to know government would play a hand. By being the bafoons ("more guns will fix the problem") they made more restrictions and laws a certainty. Thank God someone has finally done something! Had a client come n2 my hair salon wailing the sky was falling NY banned ALL GUNS! LOL. Calm down idgot! Obama's campaign was able to win the last election in part because of their detailed statistical analysis of the population that could identify likely voters. Why can't we use the same methods to identify individuals who are likely to commit crimes with a gun and prohibit those people and people like them from having access to a firearm? People who are identified as being high risk could be monitored and subject to frequent pat-downs to make sure they are complying with the law. That seems like the 21st Century way to approach this problem. Amendment 13 "Jail all Americans with assault wepons"
I agree that the mentally ill shouldn't be allowed to buy guns but it's not the guns but the people. According to USA Weekend 1-11-1-13-2013 60 children that's right 60 children are killed every week by cars and trucks that back over them. Should we ban all cars and trucks that don't have backup cameras no we should hold people accountable and should be the same case with guns. Why don't we have the same outrage about people backing over children that's easy no press coverage. Every time something happens with guns it's front page news and when you look at all the people that buy guns tell me how many of them go out and commit mass murders not that many because they follow the laws that are in place now. All I heard was when we are allowed to get a concealed weapons permit murders would go threw the roof guess what they went down. Take a breath and let's discuss the terrible murder of 20 children at a school and act like we have some common sense and not some knee jerk reaction. A ban on all semi automatic weapons is not only stupid but the people that are pushing this really don't have a clue about guns and how they work. I keep hearing that we should ban all assault weapons we don't have any on the market now. An assault weapon is a gun that can fire three rounds with one pull of the trigger, fire one round with one pull of the trigger, and car fire full automatic with just holding the trigger down. It just about the hardest permit to get is for a fully automatic weapon and if you want to put a cost on that why not charge $50,000 a year for each permit. Please know what you are talking about before you take the same path as almost every socialist and communist country out there in the world. It wouldn't take long before that could happen with all the BS going on out there right now and that includes Obama and his party. Moose is dead right ! The NRA are losing power and they know it..Gun manufacturing lobbyist no matter what won't curb the anger felt toward them for trying to change opinions at their reps request and quess what it backfired and the president will go as far as using executive powers to get bills done,republicans or not its a done deal,live with it....It should have been done years ago and the extremist NRA members know it commanding less than a 4% membership amongst all gun owners nationwide,not enough to worry about and they know they're not much of a threat anymore after this mass murder came to light...So to all NRA members get with the program or you'll go the way of the musket and you know how useful they are in todays world right!! Give me a break. You don't need a semi-automatic. Keep your handgun and stop whining. In New Youk only the criminals have the big guns. I'm staying the hell outta there.